What happens when you integrate the art of positive thinking and the freedom of spiritual well-being with the business of getting desirable results? The world of business does not rest. The journey of innovation does not end. Competitive advantage is now all about who comes up with the solution first, often without the market even knowing there is a problem. 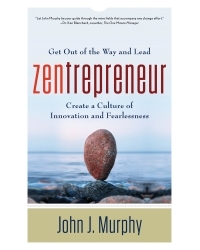 John Murphy combines profound spiritual wisdom and emotional intelligence with intellectual capital and 30 years of practical business experience to demonstrate a new level of leadership. Resistance to change is a challenge every leader must face. Here is a book on how to overcome it. John J. Murphy is an award-winning author, speaker, business consultant, and “zentrepreneur.” Drawing on a diverse collection of experiences as a corporate director, collegiate quarterback, spiritual mystic, and management coach, John has appeared on more than 400 radio and television stations, and his work, has been featured in more than 50 newspapers nationwide. In 1988 he left corporate management to start his consulting company. He has now trained tens of thousands of people from dozens of countries. His clients include some of the world’s leading organizations. John lives in Grand Rapids, Michigan.